The WordPress.com stats people have prepared an 2015 annual report for this blog. It shows some unusual and bizarre data, some of which is obscure like “how many comments” — very few people post comments to blogs so it’s a bit irrelevant. Anyway — Enjoy. And sometimes please comment! The concert hall at the Sydney Opera House holds 2,700 people. This blog was viewed about 12,000 times in 2015. If it were a concert at Sydney Opera House, it would take about 4 sold-out performances for that many people to see it. Juno Gemes is one of Australia’s most significant photographers. 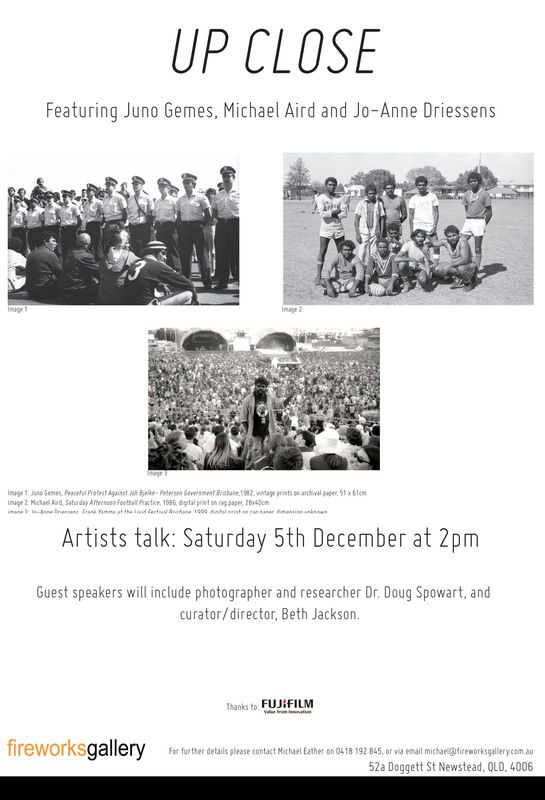 For over 40 years, she has advocated for justice, recognition and respect for Aboriginal Australians through her photographic documentation. While her photographic mode could most accurately described as ‘photo-activism’ her artworks are resolved using a range of techniques that enhance the communicative qualities of the work. These include gelatine silver prints, type C prints, photogravure, photomontage, artists books and hand-colouring. 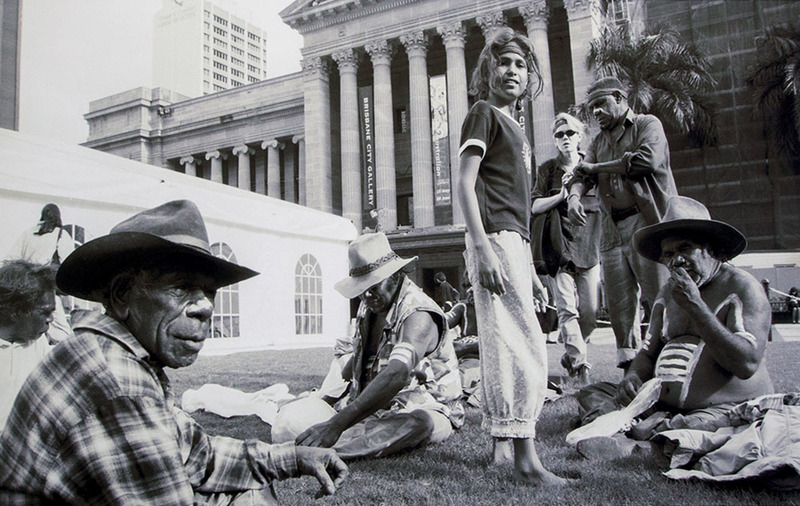 Gemes’ works have been shown in exhibitions world-wide and a solo exhibition of her Aboriginal portraits was shown in the National Portrait Gallery exhibition Proof in 2003. Photographs by Gemes have been published in all forms of media from national and Aboriginal newspapers to academic journals and publications. In a 1995 edition of the Photofile Juno Gemes poses the question: “What can a woman do with a camera?”[i] 20 years on we can now reflect upon her question, particularly as the exhibition Up Close opens at Fireworks Gallery in Brisbane, December 2015. How does one describe Juno Gemes? For me she is some kind of a rhizomic individual, a chameleon, and a shape-shifter. She is everywhere for everyone and watch out if you are on the wrong side her – particularly if it is to do with injustice. There is more to Juno Gemes. 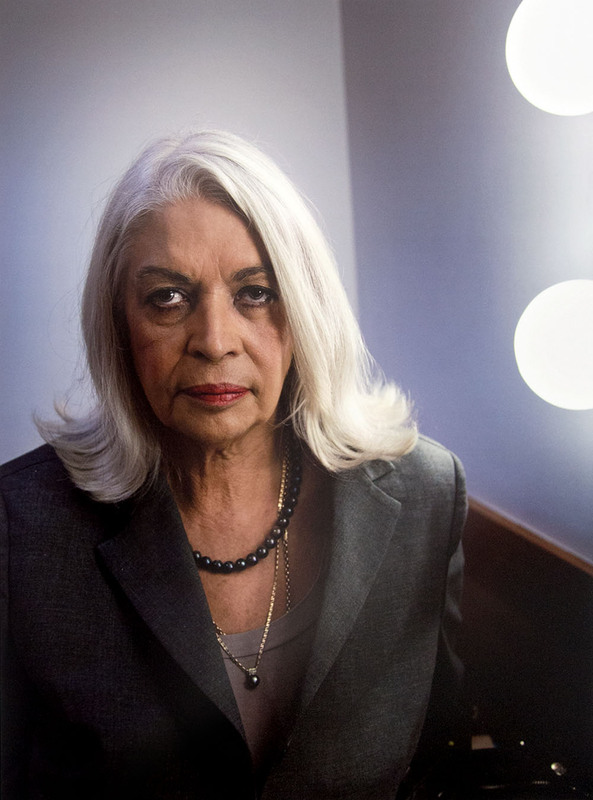 The manifesto that drives her is deeply and often quite vocally expressed, is rooted in social justice. Central to her personal crusade are concepts relating to humanity, culture/s and communication. 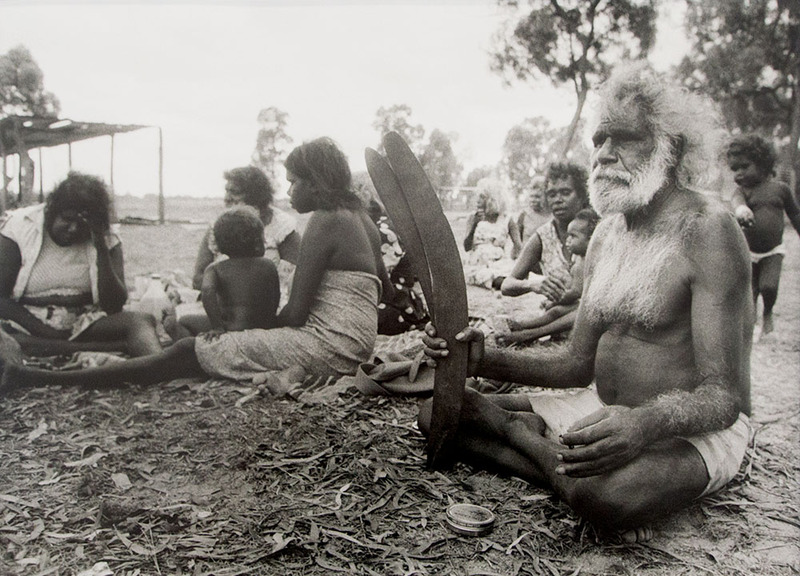 And the art of the camera and the photograph became her way of dealing with the difficult questions of the times – Australia and its treatment and recognition of its first peoples. But Gemes’ approach to photography may not have been the traditionally accepted ‘impartial’ documentary style but rather more inclusive, active and interactive motivated by her, and her subject’s desire for authenticity in the story that is told through her photographs. In 1978 when photographing on Mornington Island Juno was to ask: “What images should I make? What do you want your fellow Australian to see?” The answer from the Aboriginal community was: “Show them that we are still here, we been here all along. Show them that our culture is still strong. Show them that, my girl.”[iv] Juno made photographs then, and ever since, as an advocate of this simple request. In the years that followed Gemes was a constant photographer of The Movement its activities, meetings and people. 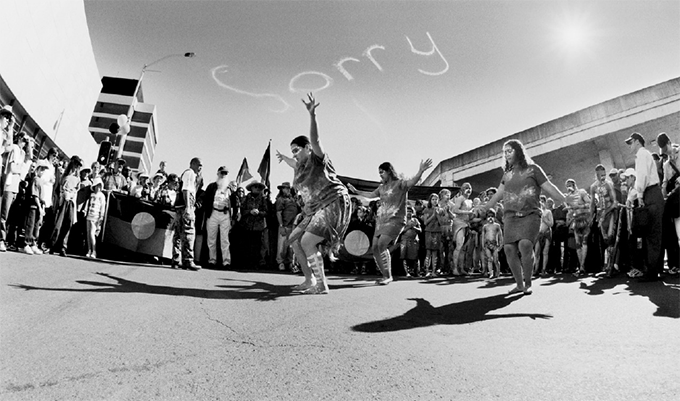 Her photographs became powerful statements, authentic, respectful bearing witness and giving voice to issues of Aboriginal identity and presence on the land. 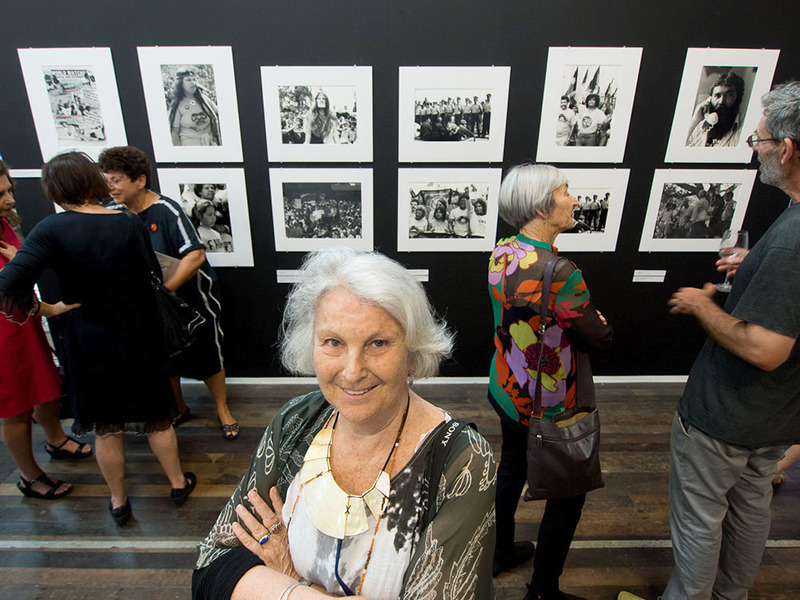 Gemes’ photographs were distributed in all kinds of media, not only those of the Movement itself but also in political and academic papers and mainstream newspapers like the Sydney Morning Herald. 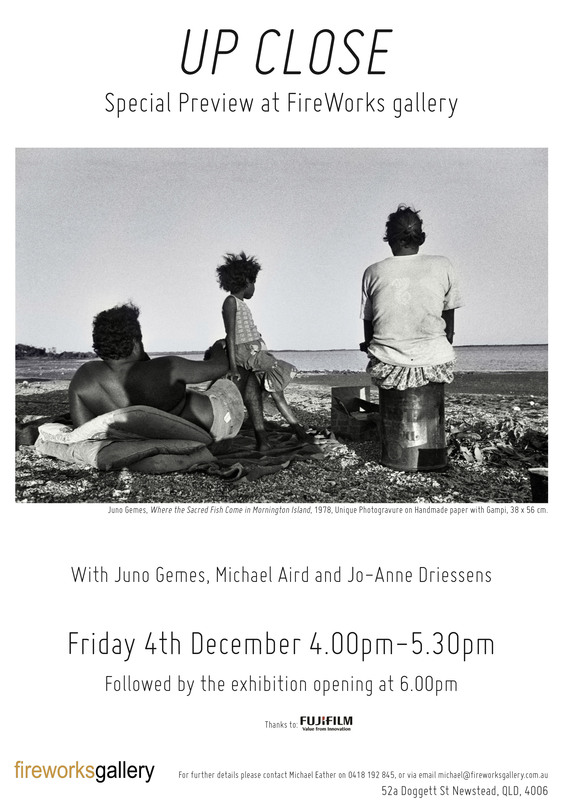 Over time Juno Gemes’ photographs have become a comprehensive record of the times, and with camera in hand, she continues to amass and archive of critical and sublime moments of Aboriginal culture, life and those who and connect with it. 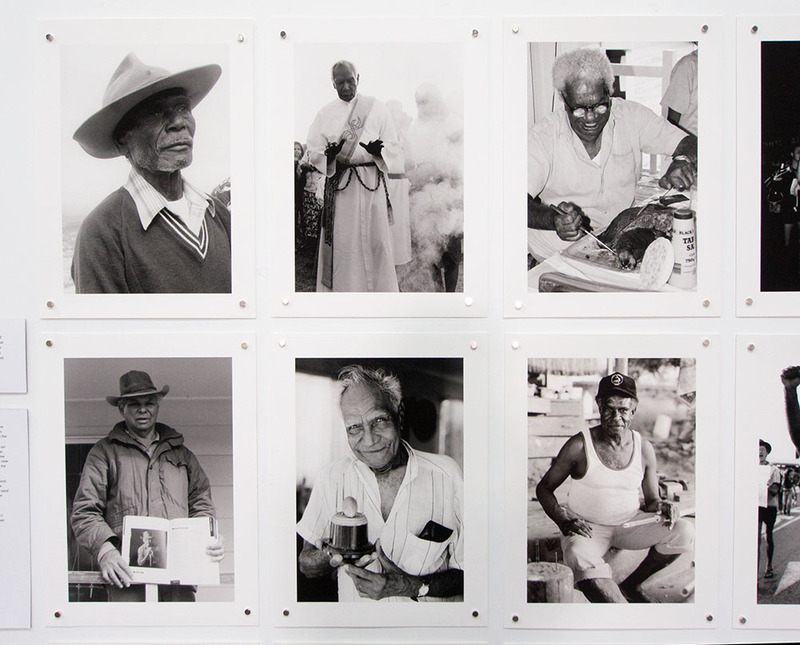 What cannot be left out in this story is the significant support that Juno Gemes’ has given to an entourage of Aboriginal photographers in all fields of practice from personal documentation to the highest levels of art photography. Her methods, ideals and integrity continues on through the work of photographers like Jo-Anne Driessens who is also in this show. I have eyes that see in a particular way. My eyes are informed by everything I have experienced, by all that I am. I saw powerful beauty, strength, resilience, ingenuity, and hope at a time where others mostly saw only despair, their own discomfort and shame. I saw what had been hidden, kept invisible. I tried to communicate from within one culture to another. It was sometimes a lonely place to be. I had many great teachers who taught me so much along the way. I understood how important it is never to forget what has been. 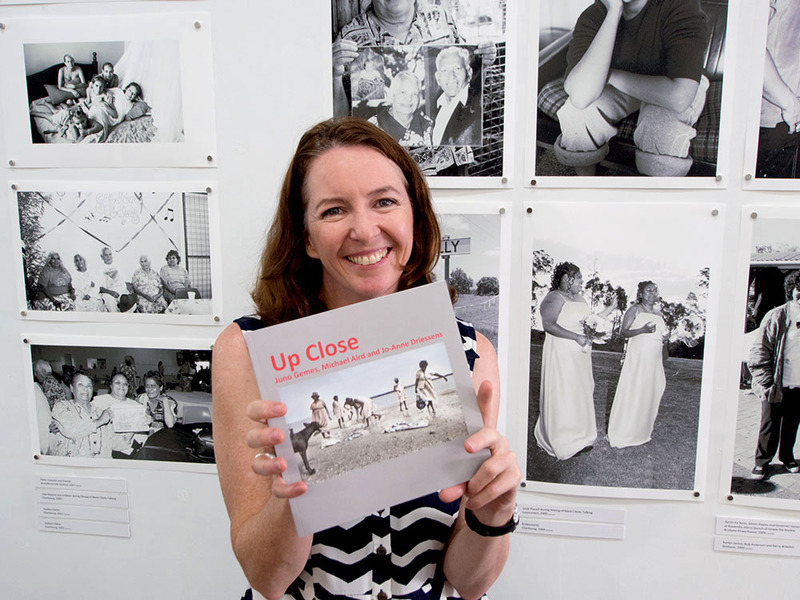 Congratulations Juno Gemes on your work in the Up Close exhibition and thank you for sharing the stories that you tell in the photographs before us…. [i] Juno Gemes, “Profile: Juno Gemes,” Photofile, no. 46 (1995). [iv] “Up Close,” ed. Fireworks Gallery (Brisbane: Keeaira Press, Southport, Queensland, Australia, 2015). [viii] “Proof: Portraits from the Movement 1978-2003,” ed. National Portrait Gallery (Canberra2003). 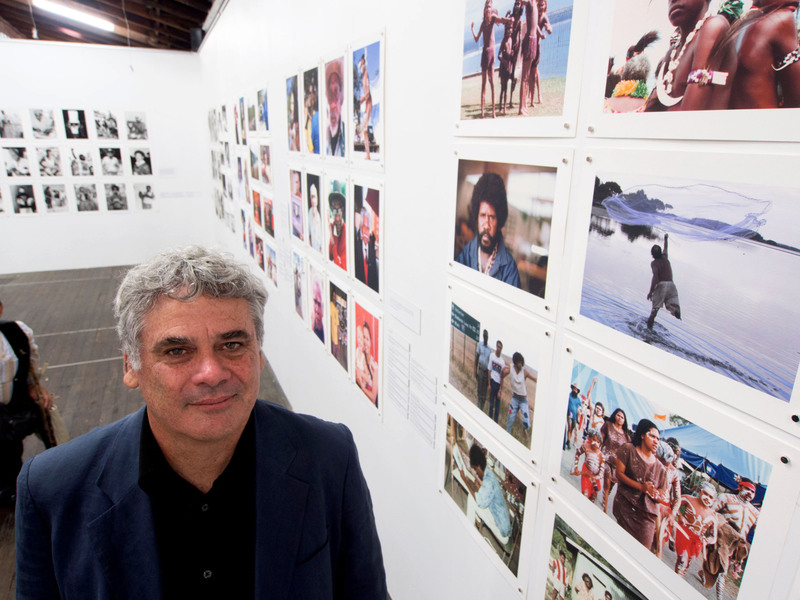 Michael Aird is a photographer anthropologist and curator of Aboriginal cultural heritage since 1985. 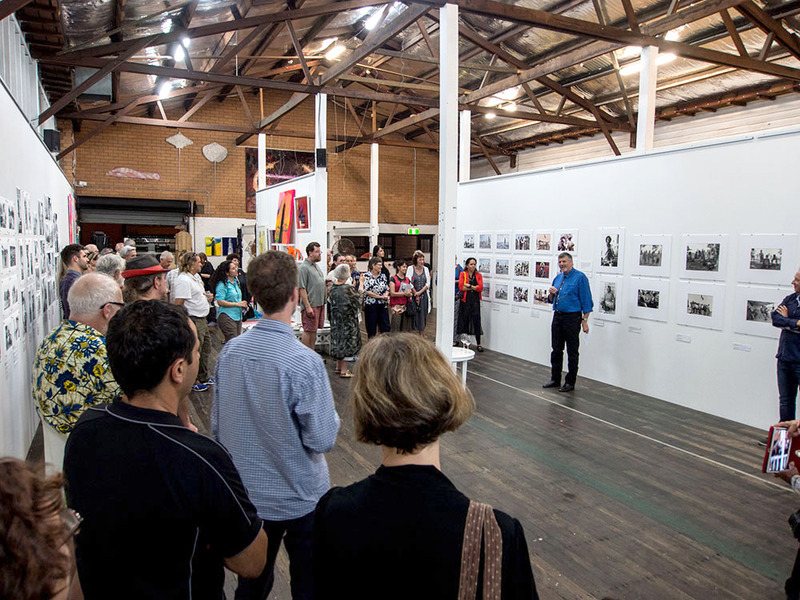 Aird has produced numerous exhibitions and publications focused on photographs of Aboriginal people, including Portraits of our Elders, Brisbane Blacks, Transforming Tindale, Object of the Story and Captured: Early Brisbane Photographers and their Aboriginal Subjects. Michael Aird established Keeaira Press in 1996 and this year was awarded a University of Queensland Alumni Indigenous Community Impact Award. He is also the President of the Gold Coast Historical Society. Michael Aird’s photographs deal with photographs of the everyday – He is interested in ordinary people and their lives. Although his work includes portraits of the leaders and elders he turns the interest of his camera lens on those not usually photographed as part of a community record. All his photographs are carefully catalogued and archived creating a significant record of the subjects and localities he has photographed. 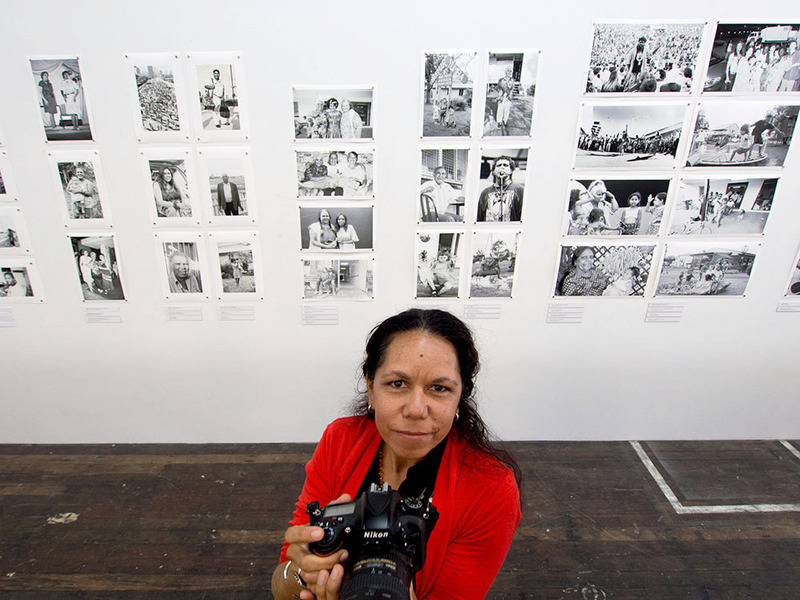 Completed a Diploma of Photography and a cadetship at the State Library of Queensland working as a photographer and later as an Indigenous Research Officer. She has worked as an assistant to Juno who has also been her mentor and supporter. 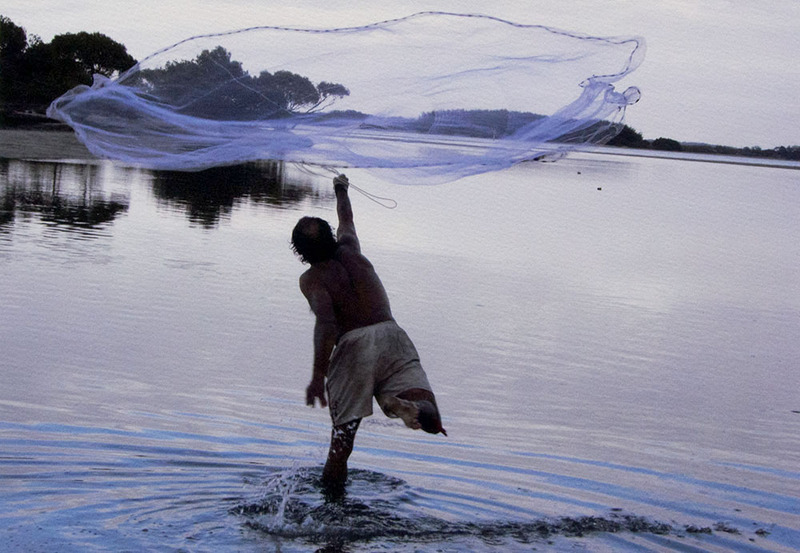 Over a 15 year period she has had an extensive photography documentary and exhibition practice. 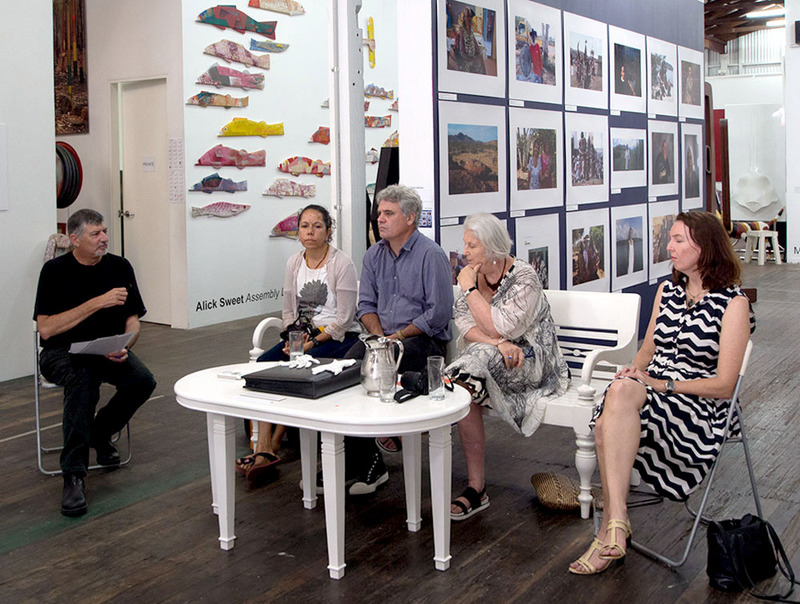 Jo-Anne has acted in a number of roles and positions including her current one as a Senior Arts and Culture Officer and exhibition curator for the City of the Gold Coast. She was recently selected to participate in the Wesfarmers Indigenous Arts Leadership Program in Canberra. Jo-Anne Driessen’s work centers on community and family. Her images can at times be a record of major activities and events – yet on other occasions they may be personal expressions and exchanges between friends and family. Beth Jackson is a multi-discipline arts professional, curator and consultant of contemporary art. A sound recording of the hour-long talk is available by ‘Clicking’ the link below. The file size is 15mb and will be available to download via a link to Dropbox. 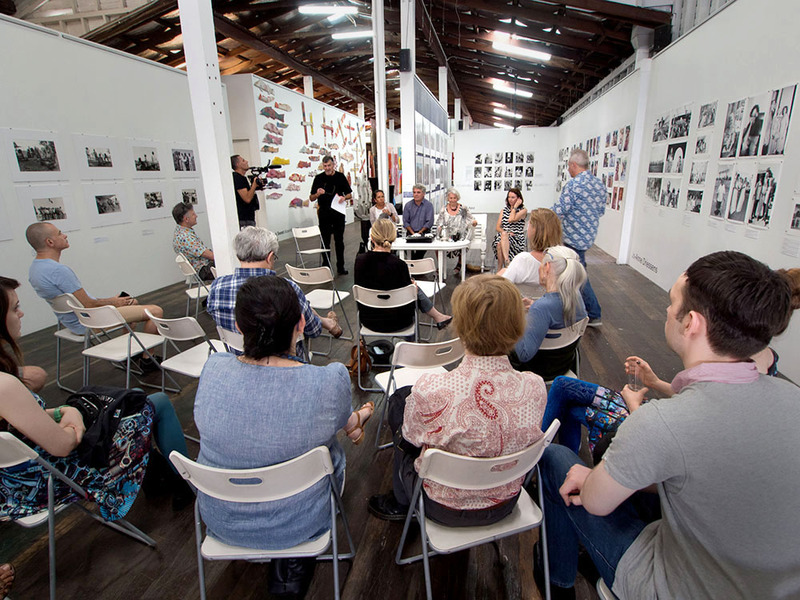 The copyright of all photographs of artworks is maintained by the photographers. All other photographs ©2015 Doug Spowart + Victoria Cooper.